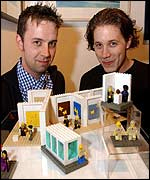 Using various media including photography, sculpture and installations, the Little Artists has been concerned with the issues of cultural identity, branding, advertising and commercialism in art world, encapsulated at Art Crazy Nation, their infamous show in London and New York, 2003-2004. Lego models of artists famous for their sensational works and wealth, such as Damien Hirst, Andy Warhol, Tracey Emin symbolise the commodified status of an artist in a capitalist society. However, the appeal of The Little Artists’ art lies in their ingenious ability to translate serious socio cultural issues and hegemonies of art world into the humorous and light-hearted imagery of popular culture. The Little Artists have been exhibited across the UK, Europe and in New York, Auckland as well as Beijing. Their works are in the collection of the Walker Art Gallery, Liverpool, UK. Cake & Neave (The Little Artists) is represented by Collectors Contemporary.